While I am on the theme of flat breads with toppings, I thought I would share with you a small selection from around the world. 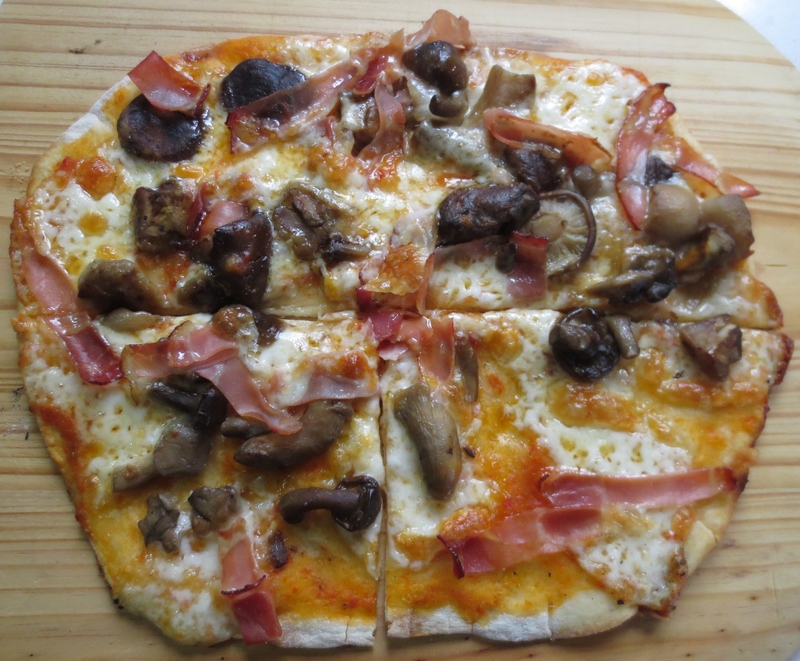 I came across a mention of Tarte Flambee in an article recently where the recipe instructed you to buy a ready made pizza base on which to place the toppings. This misses the whole essence of the dish, which is fineness. The bread base wants to be rolled as thinly as you can into a rectangle. When I was cooking this regularly in a restaurant I would use day old dough that was less springy than fresh and consequently easier to roll thinly. A standard bread dough as in the previous post is used for the base. As I have said roll it thinly into a rectangle to fit either a silicon or metal baking sheet. 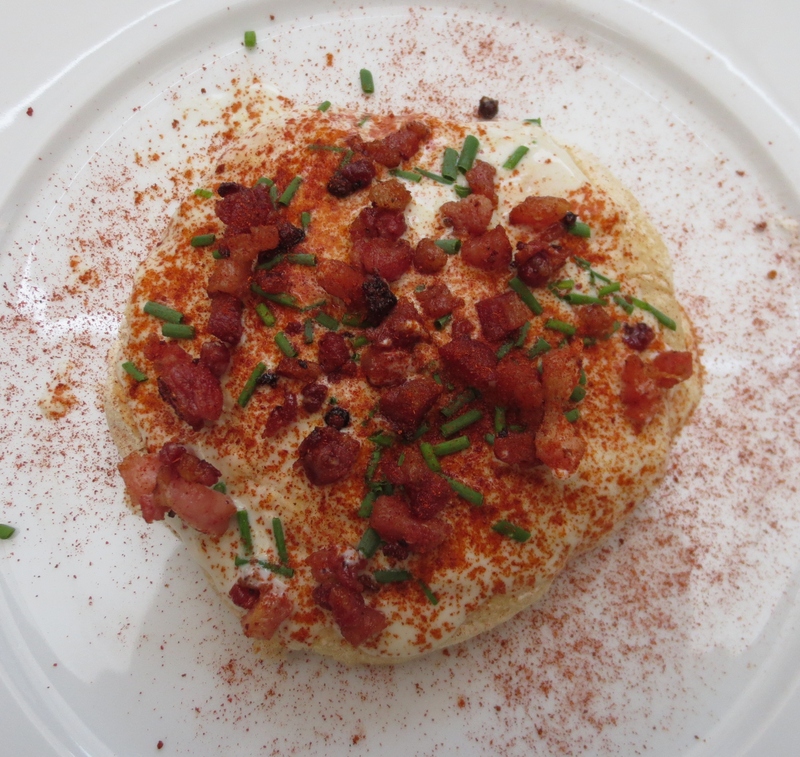 The classic topping is a smearing of thick cream, then onion that has previously been sliced thinly and softened in butter and small lardons of smoked streaky bacon. Preheat the oven to 250 C with the floor lined in fire bricks as in the previous post. Place the tart on its sheet onto the bricks to bake. As the dough is thin it will only take five or six minutes for it to be cooked and crisp. Sliced mushrooms softened in butter – even better if thy are wild mushrooms – with or without the bacon. Shredded spinach softened in butter. Asparagus, either white or green or both. 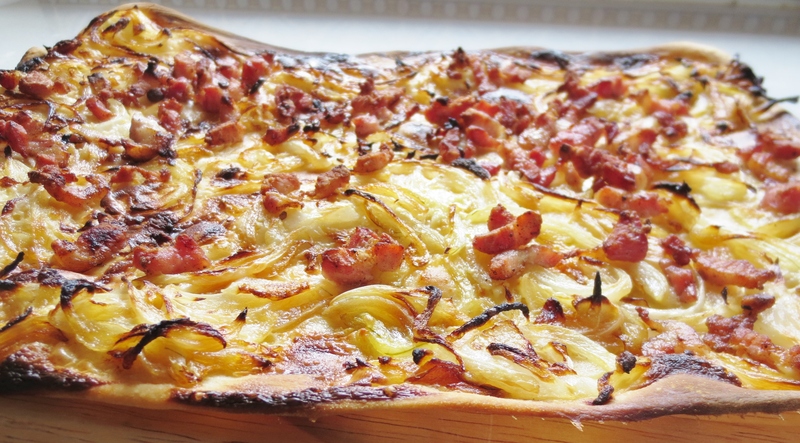 The onions with thin slices of sauccison sec, or strips of cooked ham, or strips of mortadella. The Provencale Onion Tart takes the same idea to the south of France and makes it more robust. Line an oiled shallow tart tin with bread dough rolled to about half a centimetre thick or a bit thicker. Peel and slice 3 or 4 large onions thinly. Soften in olive oil and continue cooking slowly until the onions are much reduced and starting to caramelise. Distribute the onions evenly over the base of the tart, drizzle over some cream and decorate with a scattering of black olives. Bake at 230 C on the bricks for 10 to 15 minutes. To test if it is done, lift up the tart with a palette knife and check that the dough is cooked to a light brown firmness underneath. Langos – pronounce the s as sh – hails from Hungary. I was visiting there with some friends, and the family of Zsuzsi prepared this and baked it in the most amazing ancient bread oven in the little house on their allotment. A bowl of sour soft fresh cheese. Tiny cubes of streaky bacon, fried until quite dry and crisp. Both sweet and spicy smoked Paprika. A bowl each of chopped dill, parsley and chives. The dough for this is made with the addition of mashed potatoes, which makes a very soft and fluffy bread. Use the bread recipe in the previous post adding 150 grams mashed potato and cutting the water down to 200 ml. If the dough seems too dry at that, then add a little more water. It is impossible to be more precise as potatoes vary so much in their water content. When the dough is ready, form into individual sized breads about 10 cm across and about a centimetre thick. Put them on a floured tray in a warm draft free place to prove for half an hour. Heat the oven to 230 C with the fire bricks in. Bake the Langos on the bricks for about ten minutes or until a lighbar brown in colour. Serve while still warm with the toppings as described. 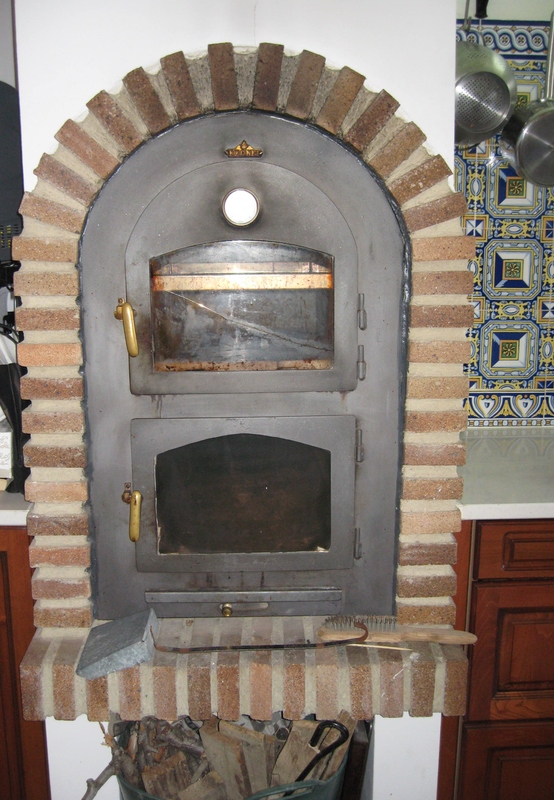 Other recipes to search out for yourselves are Turkish Pide and Cocas from the Balearic Islands. I am very fortunate to have in my kitchen in the farmhouse a fabulous wood burning oven, so for me to make good pizzas at home is not so difficult. I am well aware that the average kitchen is not so equipped, so I have been experimenting with a standard fan oven to see how to achieve the desired crispy pizza. The key to success involves a trip to your builders suppliers to buy some refractory or fire bricks. These are the bricks that are used to line fire places and traditional ovens. You will not need many, just enough to line a shelf of your oven. Even though I have the wood burning oven, lining the floor with fire bricks has improved hugely the quality of pizzas and breads that I bake. It is possible to buy online bread stones which will do a similar job, but without buying several and trying them out I cannot vouch for their effectiveness. Having said that, the pros and cons seem to me to be that; the fire bricks are usually 3 cm thick, which will hold the heat better than something thinner, and so cook the pizza quicker and give a crisper result, but to get the bricks to fit your oven you might have to trim some of them. The fire stones come in a neat size and shape, but are generally thinner, so may not give you such a crisp pizza. The fire bricks or pizza stones act in a similar way to the thick base of pans – they hold and evenly distribute the heat. When you put your pizza or loaf on the hot bricks, there will be enough heat already in them to start cooking it straight away, and hence you get a crisper result. The bricks or baking stone need to be put into a cold oven and then heated up, and when you have finished baking leave them in the oven to cool down slowly. If they cool too rapidly they are likely to crack. In a fan assisted oven heat it to 250 C which is the maximum in mine. At his temperature the pizzas will only take about 7 minutes to cook, so bear this in mind and either remind yourself with a timer, or don’t wander off. This is important when you have guests who can distract you. You can tell that I am speaking from experience here. 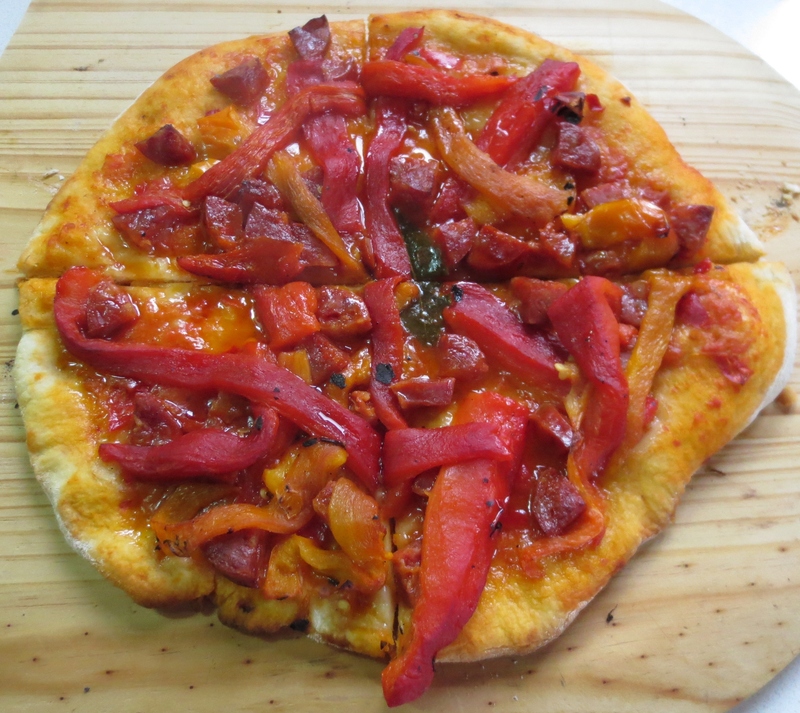 The other key to creating an authentic style crisp pizza is to go light on the toppings especially the wet ingredients. Remember the toppings are there to flavour the bread rather than the bread being a raft for lots of heavy cheese and salami. Also getting the pizza onto the bricks is not so easy and when it is heavy with toppings it is much more likely to break. For novices I can recommend using one of those silicon sheets. Lay the pizza base on the sheet, add toppings and then put the whole thing on the bricks. I make my dough in a bread machine – simply put all the ingredients in the machine, the order is not important, put it onto the dough programme, and leave it to it. If you don’t have one then making it by hand is not complicated. Sieve the flour into a bowl or onto a board and make a well in the centre. Measure the water in a jug and add to it the salt, yeast and oil. Stir to mix. Pour the water mix into the well in the flour and bit by bit mix with the flour. If you have a dough hook attachment for you mixer you can use this. Turn the dough onto a floured board if it is not already on one, and knead to mix well for about five minutes. Put into a bowl that will leave room for growth, cover with cling film, put in a warm draft free place for about an hour or until it has doubled in size. The dough made in the machine and the hand made are snow at the same stage. Turn the dough onto a floured board and knead for a couple of minutes. It will lose some of its volume, but don’t worry. It is now ready to be rolled into pizzas. The size is up to you. If you are feeling up to it you can have go at the twirlIng method used by the professionals. I am rubbish at it, so can offer no advice, I use a rolling pin pastry style and plenty of flour on the work surface to stop it sticking. So to toppings.This is where creativity and imagination can be used, although the choices are much more often down to what is in the store cupboard or in season. The simplest is to brush the rolled dough with olive oil and then sprinkle with salt. Add chopped or crushed garlic and you have the best ever garlic bread. The oil with fresh herbs especially rocket, rosemary or basil. Try the herbs with grated lemon zest to add extra zing. The topping above is yellow and red peppers stewed in olive oil with garlic and chorizo. I make Passata in the summer from tomatoes, garlic and courgettes and this is perfect base on pizzas for either seafood, or the Neopolitan mix of black olives, capers, chilli and chopped garlic. Now we start with the cheese. I love Globe Artichokes sliced thinly and stewed in oil, put onto the pizza base and strewn with grated salty Parmesan. A new favourite since the visit to Naples is smoked mozerella and chilli. Here with Parma ham and mushrooms. 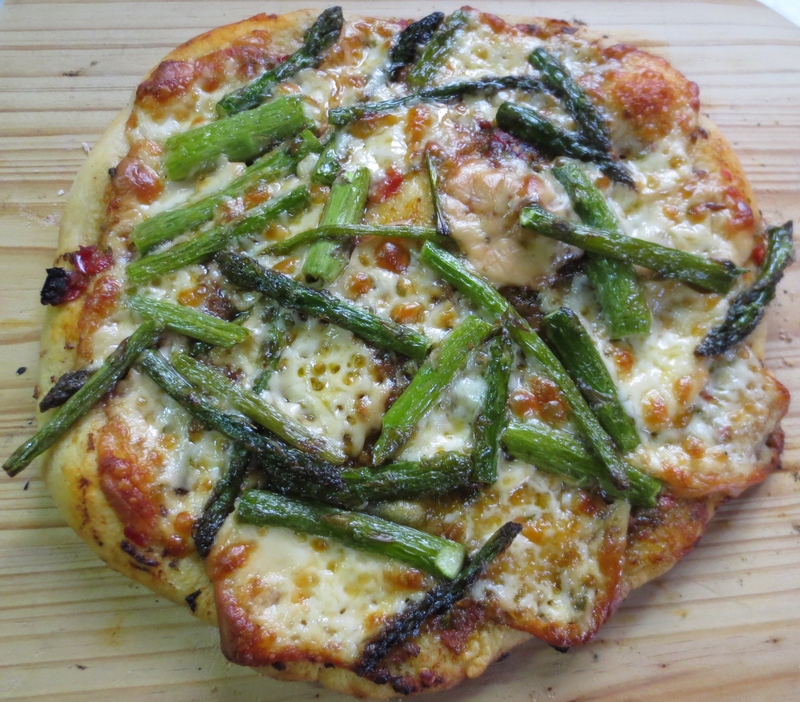 A smearing of tomato, then thin shavings of Pecorino, and fresh Asparagus. The options are endless and yours to choose. Have fun with them.